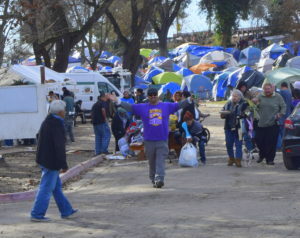 A bevy of Stanislaus County service workers, many wearing purple T-shirts emblazoned with the motto, “Together We Rise,” brought food and comfort to the homeless encampment at Beard Brook Park Saturday, just three days before Christmas. Working off the clock, many of the workers are part of the county’s outreach effort and know village residents by name. 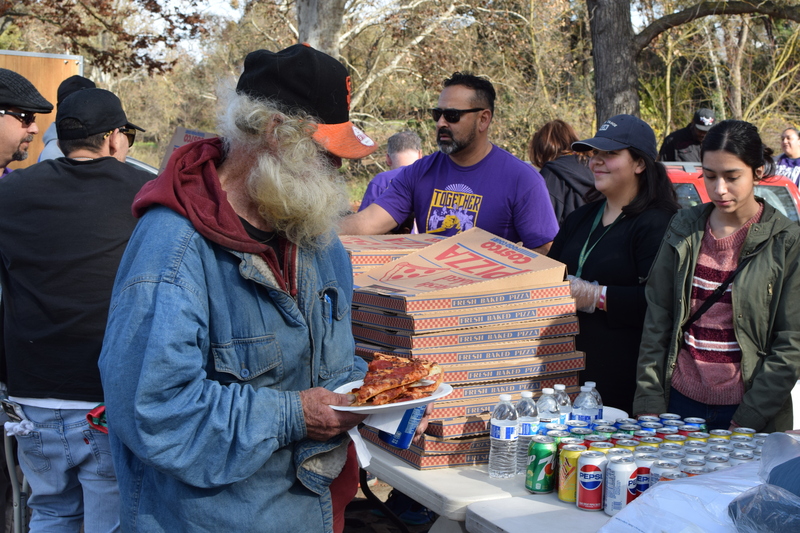 They helped distribute pizza, pillows, blankets and Christmas cheer to the hundreds of people who have crowded into Beard Brook Park since the City of Modesto designated it a permitted location for camping. Recent gray skies and rain gave way to sunshine and brought uplifted spirits to the camp now known as “Beard Brook Village.” Residents of the village had been disappointed when the city announced campfires would no longer be permitted due to problems with too much smoke. 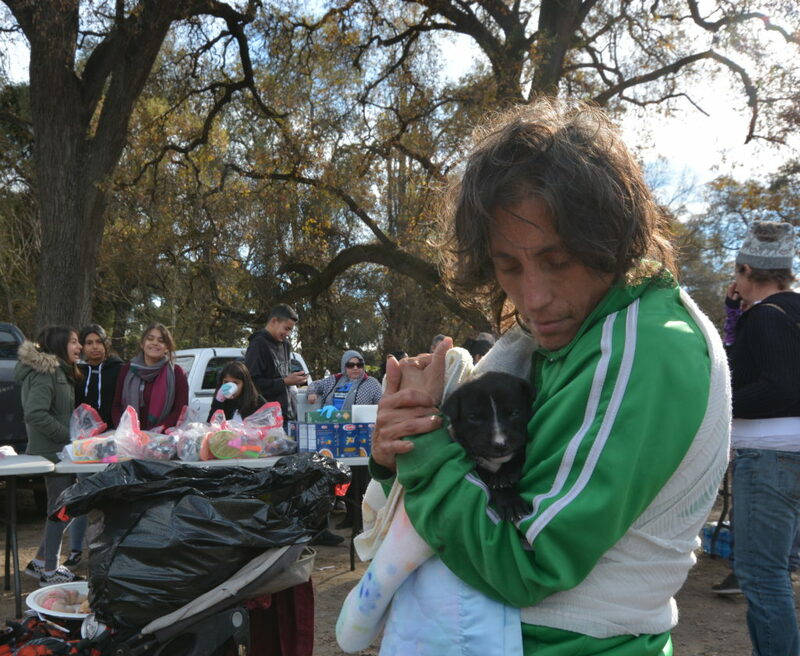 The fires had been the only way people had of providing themselves heat, warm food, and coffee. Saturday’s sunshine was welcome and so were the warm food and drinks. 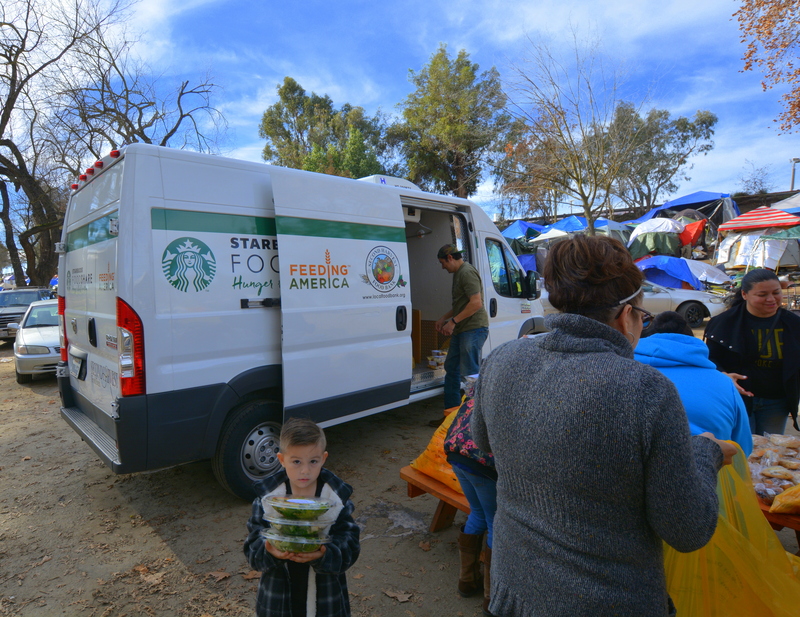 County workers were joined by members of El Buen Samaritano Church of Modesto and the Second Harvest/Starbucks Food Bank, as well as volunteers who routinely help whenever they can. In addition to mounds of food, drinks, and toys for children of the homeless, volunteers distributed blankets, pillows, and warm clothing. Beginning with a few tents and some thirty or forty people, the village population has burgeoned to about four-hundred residents,* most of whom are living in tents on the steep slope along the park’s west side. 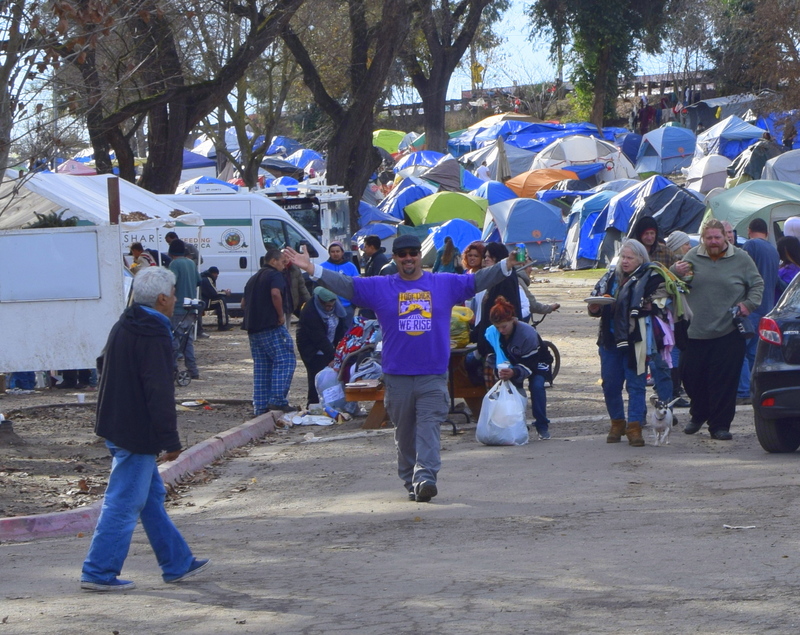 City and county authorities plan to move the camp a few hundred yards west to a location with flatter ground so that winter rains aren’t as much of a problem for the tent dwellers. Under current conditions, heavy rains create mudslides, the wind topples tents, and people in the village are in constant danger of slipping and sliding on the wet mud that forms on the slope. Authorities also hope to provide sturdier tents for those who need them. Many campers have only flimsy tents that collapse or blow down in a storm. Ideally, the new village will serve as a low-barrier shelter for people who would otherwise be living in local parks, camping along rivers, and sleeping behind buildings downtown. Hammond works closely with camp coordinator Frank Ploof. Both men have years of experience working with homeless people and manage to combine necessary discipline with compassion for people in need. Some residents of the village have already moved on to more permanent housing; with county workers located in the park itself, it will be much easier to evaluate people’s needs and direct them to the appropriate services. Meanwhile, generous giving by local churches, charities and individuals brings the true spirit of Christmas to hundreds of people who, but for the comfort of a tent on a hillside, would be on the streets or hiding in a park or alley, waiting for the next order to move along. Thank you for sharing this wonderful story Eric.